Today, December 12, 2016, the first pair of “Adir” (F-35I) stealth fighters landed in their new home, Nevatim AFB. The landing ceremony, which was slightly delayed due to heavy fog in Italy and American safety protocols, was attended by the PM of Israel Benjamin Netanyahu, the President of Israel Reuven (Ruvi) Rivlin, the Israeli Defense Minister Avigdor Lieberman, the Chief of the General Staff Lt. Gen. Gadi Eizenkot, IAF Commander Maj. Gen. Amir Eshel, heads of the involved military industries, the United States Secretary of Defense Ashton Carter, U.S Ambassador to Israel Daniel Shapiro, the President of “Lockheed Martin” Marillyn Hewson and delegates from around the world. “Today, the fifth generation revolution begins. 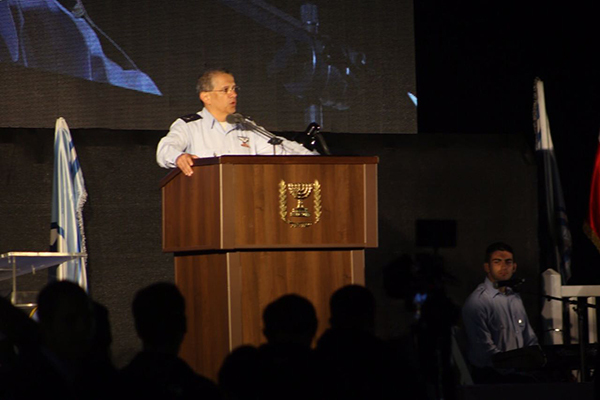 The ‘Adir’ is about to become a powerful accelerator for the entire IAF”, said Maj. Gen. Amir Eshel, IAF Commander. “We plan on leveraging our systemic abilities to new heights in attack and defense. Our aerial force will be much deadlier, combined and more relevant than ever”. “The ‘Adir’ (F-35I) stealth fighters and pilots will be able to operate in every arena, near and far” said the Prime Minister of Israel, Benjamin Netanyahu. “Our goal is to obtain supremacy in every theatre: in the air, in the sea, on the ground and in the cyber arena. We build our force and sharpen our abilities in defense, attack, deterrence and decision. The ‘Adir’ jets will strengthen these abilities”. 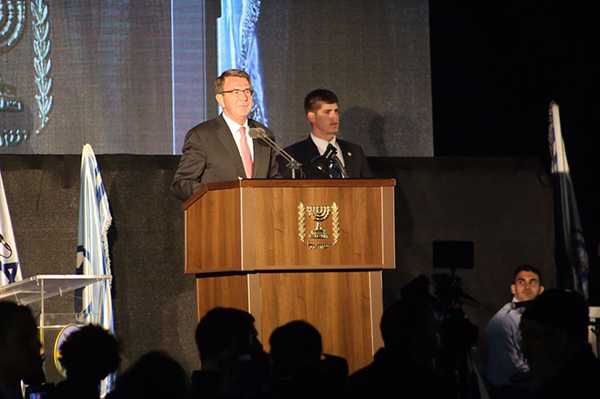 U.S Secretary of Defense, Ashton Carter, added: “As of today, Israel is our only friend in the region flying the F-35. F-35s will help the U.S. and Israel Air Force operate more jointly and more effectively. Together, we will dominate the skies”. The pair of “Adir” (F-35I) jets that landed today are the first of 50 aircraft whose acquisition has been agreed upon so far. They will bring the IAF into the fifth generation of fighter aircraft and consist of a significant quantum jump in capability. The jets hold advanced capabilities new to the IAF such as sensor fusion, stealth and situation awareness. In addition, their arrival will bring new concepts into the IAF in various fields such as logistics, training and instruction. An example for such a conceptual change is the heightened significance of simulators in “Adir” pilot training. The IAF aspires to perform 50% of “Adir” flight hours in simulators. “Today, a fascinating meeting between man and machine begins, between our excellent pilots and maintenance personnel and the forefront of flight technology”, stated Maj. Gen. Eshel. “The jet will become exceedingly ‘White and Blue’ in its operation and systems. Each ‘Adir’ will be an awesome attack machine, an information and control center that will operate successfully in the face of dangerous threats in ways completely different than those we are familiar with”. “No jet, sophisticated and advanced as it may be, can decide the battles of the future alone. 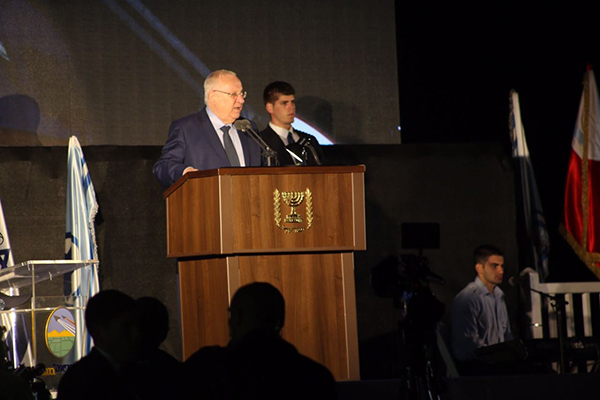 You are the wind under its wings, you are the people who will decide the battles”, said President of Israel, Reuven (Ruvi) Rivlin. 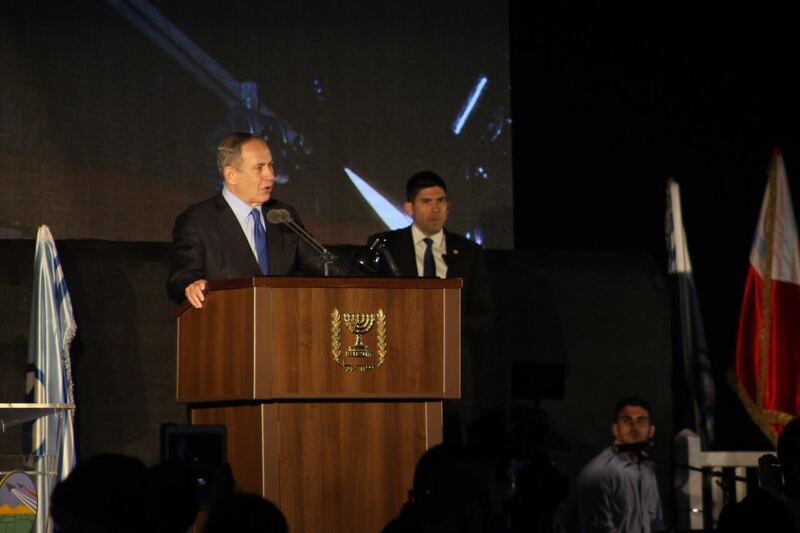 PM Netanyahu added: “Israel is taking off to new heights, and when our pilots in the ‘Adir’ jets will fly high, we will watch them with pride”. Six years after the acquisition deal was signed and a year and a half since the “Golden Eagle” Squadron (that will receive and operate the “Adir”) was established, the jets have arrived in Israel. Until now, the squadron personnel: pilots, ground crews, intelligence and operations personnel studied the advanced stealth fighter in order to achieve their goal – the “Adir”, operational by December 2017. “The IAF Commander gave us a goal – to take off for our first flight tomorrow and we definitely intended to reach it”, shared Lt. Col. Yotam, the first “Adir” Squadron Commander. “We must quickly transition from the exciting atmosphere to operational work in order to stay on schedule”. During the coming year, the squadron is expected to hold various test and training flights, in order to better grasp how to make the aircraft’s activity more efficient and adapt it to the IAF’s needs and the current arena. Simultaneously, the IAF will continue training additional aircrews for the F-35 and developing the abilities of all “Adir” personnel, on the ground and in the air. “We will first make sure that we are providing the proper safety conditions for the jet’s activity, train ourselves and develop combat doctrines”, shared Lt. Col. Yotam. “We will begin operational activity only after deeply examining the aircraft and making sure that we are ready”.